The MFW wants to create media innovations that are relevant to society. Each year we boost the professional and personal development of the top 1% upcoming media professionals from 10 Universities of Applied Sciences. We equip them with the knowledge, tools and insights so they can make a difference. We do this by facilitating a week with 10 world renowned speakers, 50 hours of co-creation program, design-loops, break-out spaces and workshops. 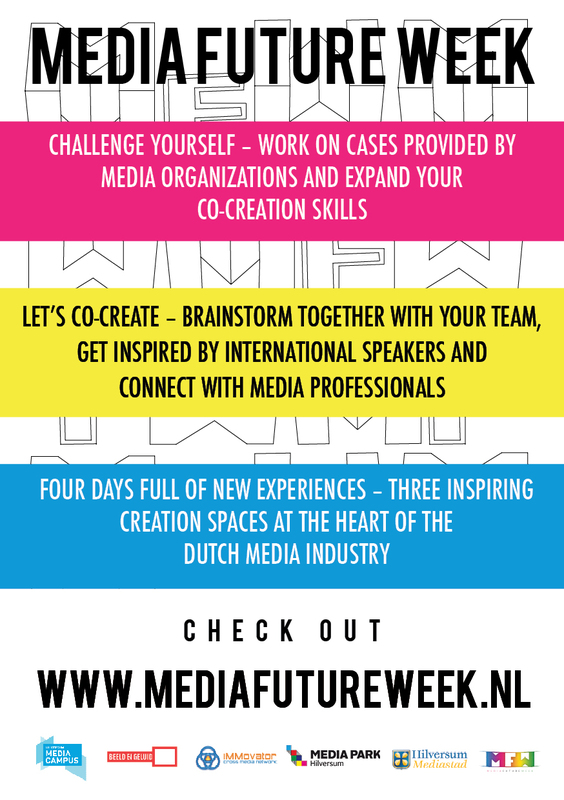 The MFW15 takes place at the Hilversum Media Park from April 20th-23rd 2015 where 120 future media professionals, over 100 contributing professionals and five open minded case partners are combined to create concepts designed for society. The 2015 case partners are: VondelCS, NOS, Municipality of Hilversum / Ziggo, TWC, Sound & Vision, Angry Bytes, Ericsson and Future Education. VondelCS is a place where in cooperation with organizations, initiatives or individual creators, a diverse range of quality programs and activities in the field of media, culture and opinion is realised. VondelCS focuses on talent and innovation! VondelCS wants to know how it can bind talented media, culture and opinion makers, thereby developing itself into a national hub for innovation in media, culture and opinion in a lasting way. This results in a concept that uses a hybrid space of physical and digital components that makes VondelCS a place where young creators want to present and realise their ideas. NOS is a public news organisation that reports independently about news and sports for every Dutchman from 0 to 100 years old. NOS wishes to know how to tailor the content of news items to users, based on the profile and the context of that user, so to improve the relevancy and accessibility of news items. This results in a concept that shows how specific news items can be differentiated in what manner. This concept will be applied to illustrate three personas for a number of actual news items. The Netherlands Institute for Sound and Vision safeguards 1M hours of Dutch audiovisual heritage and keeps Dutch history alive in sound and image. By doing so, we facilitate people to learn, experience and create. Sound and Vision wishes to explore how to integrate on-site and online visitor experiences, resulting in a complete experience that also has a prologue to a visit and an epilogue. The focus of this experience is the key story of the Sound and Vision museum that fits perfectly with the theme ‘Designing for Society’: “how does media influence the way I view the world and my place in society”. The outcomes result in a changed mindset of Sound and Vision visitors, and allows them to look more critical at the role of media in society and how media influences themselves and others. The municipality of Hilversum and Ziggo create a free broadband mobile network in the city center of Hilversum. Hilversum and Ziggo wishes to know how to apply this network to make the city center a pleasant place where people like to come and can meet each other, and to improve the quality of life. This results in a concept that shows how aspects such as hospitality, liveliness and clarity of the city center have been taken into account and that makes ample use of media applications. Consider user experience, accessibility and added value of the concept. TWC is an enabler of consumer engagement across connected devices, creating awesome digital media experiences. TWC wishes to know how relevance and context can empower TV audiences in the future to enjoy relevant media experiences at any time in any situation. This consumer based UX results in a concept for an improved family life that utilises real time information and media libraries in conjunction with readily available connected devices. Ericsson Broadcast and Media Services is the largest radio and television managed services provider in the world. Ericsson believes that in the networked society everything that can benefit from a connection will benefit from a connection. In this connected society consumers will consume media on any device, at any moment of the day and at any place. Currently radio still has a strong position. Programs have already become much more interactive and have been enhanced with social media components. Ericsson managed services facilitate these developments. Ericsson wishes to know what the role of radio in society will be and how future radio consumption will take place. Will Live events be leading? News? Music? DJ’s? Otherwise? This results in new business models and in concepts of how radio will integrate with other media, during the day, in different types of cross media formats. Angry Bytes is an interactive agency that connects people using the latest real time online technology. Angry Bytes wants to take the next step and explore the possibilities of connecting groups of people in real time to facilitate them in improving their lifestyle, making use of local-for-local insights across the globe. This will result in a concept that creates disruptive innovation, supports many-2-many connections in real time and enables groups to maximize their happiness and health. Media Future Weeks’ purpose is to bring participants to the next level in their field as media professionals and improve the relationship between education and media industry. Media Future Week wishes to know how (media) education on Universities of Applied Sciences will have taken shape in 2025 and what does this mean for you as an educator. How to port your MFW experience to the education practise and how to secure those learning processes will take place, matching the needs of students and society. This results in concepts that build on use of media, hybrid learning environments, interactions between spaces and learning processes, educational theories and passion & insights of team participants.